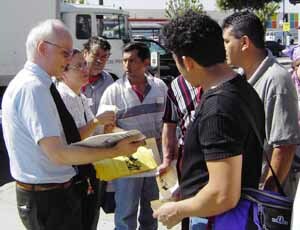 Joel Britton (left), Socialist Workers candidate for governor of California, speaks with meat packers at shift change outside Farmer John plant in Los Angeles September 8. 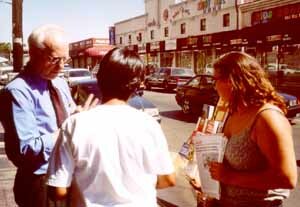 Socialist candidate campaigns in Los Angeles with Olympia Newton (right), a leader of Young Socialists for Britton. Statement Statement by Joel Britton, SWP candidate for governor of California, submitted for the state voters guide. GIsp.pdf Candidates statement recorded September 16 for U.S. military personnel abroad (in Spanish: special supplement to Perspectiva Mundial). October 20, 2003 Nationalize the energy industry! 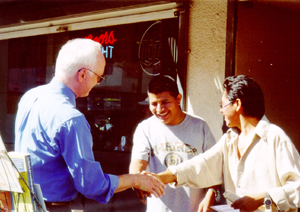 September 29, 2003 Vote Socialist Workers!